One half of the umbrella's fabric diameter -- measure over a rib from one edge to the center point. The number of triangular pie shaped panels with seams radiating from the center (often 8 as in the image above and never less than 3). Finished width of the doubled hem all round the Umbrella. A one inch hem would add two inches of fabric to the length of each gore. This will be zero if a binding is used to finish the circumference of the umbrella. 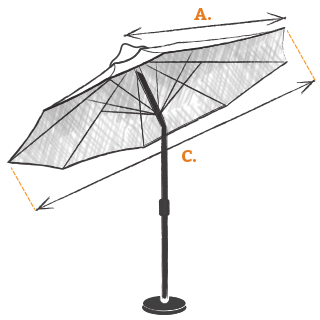 Measure the diameter of the opened umbrella if possible. This diameter will normally be roughly 10% less than twice the radius measured above. This measurement determines the shape of the umbrella "cone". A 16 inch opening will be provided at the center with a 28 inch circular fly to cover it. There will be no hole at the umbrella's center.